If you do not know Mind Collected yet, learn how you can use it first. You can use it as a Personal Visual Knowledge Base, Learning and Memory Tool, or as a Visual Collector’s Software. To get started quickly, I recommend that you check out the Quick Start Guide first. You can see the individual help chapters on the right. The most important chapters are Tags, Items, Connecting Items and Notes. You don’t need to read all the chapters, but once you get serious about using Mind Collected, it’s a good idea to review all the chapters so you get the maximum benefit out of Mind Collected. You might notice that I’ve added discussion into each chapter. Feel free to post your follow-up questions or feedback to any of the Help topics so I can keep improving them, but please try to stay on topic. For general or off-topic questions, please use our Mind Collected support contact form on the Dextronet website. 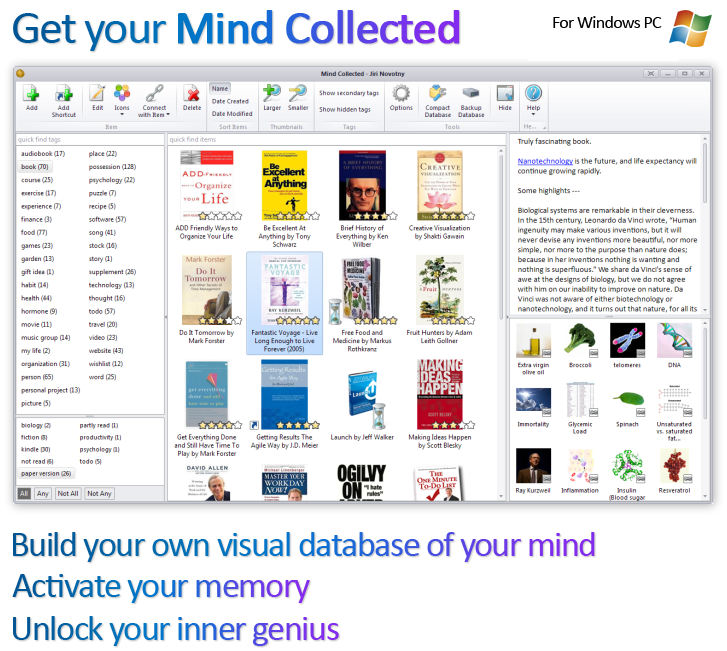 Mind Collected is a completely new software invented from scratch. It can be you, personally, who will decide how it’s going to evolve next. I would love to hear what you think! Oh, and in case you don’t have Mind Collected installed yet, you can download free 30-day trial from Dextronet. I hope that you will find Mind Collected as life-changing as I did. I feel that since I’ve started using it, it has started my new personal renaissance. Enjoy having your Mind Collected, and have a fabulous day! I agree with you. Having Mind Collected on a mobile device would be perfect – and if there’s demand, we will make it happen. Many modern tablets already run full-featured Windows 8, so you can use it there, and I am already working on touch support for Mind Collected. On other mobile devices, you can use your favorite note taking app, and then copy the content into Mind Collected when you get to your PC. For example, when I am reading books in Kindle, I highlight parts of the book and make notes right on Kindle, then when I go to my PC, I copy it into Mind Collected from the Amazon’s Kindle web service. Is there any way to do Boolean searches? The separate category and subcategory feature isn’t terribly efficient, even when set to all it doesn’t seem to find “Ax” and “Bat” together, even when the “All” Tab is selected – OR am I missing something? Also, a downloadable manual would be nice.. Thank you for your question. Currently, Mind Collected supports full-text search where it looks for sub-strings, so it can’t do a Boolean search. Downloadable manual is a good idea. I’ve been unable to use Mind Collected for the last 10 days or so. It’s telling me there’s a db corruption and that I can restore from a backup. The problem is, I load an older version and then after performing one action, it crashes again and refers to the same problem with the most recent backup. Given I’ve been collecting and collating all my information in here for quite some time, it’s of great concern that there isn’t as fix for this yet. Every time it crashes, I submit the crash report; I try again and the same thing happens. I reboot and then get told there’s a new fix available so I download install and the same thing happens. I understand software goes wrong (that’s why they’re called bugs), but it’s now looking like Mind Collected is a single-point of failure. So, given that it can’t be relied on in the future, I need a backup solution as well now. So, at the very least, give an option to export the db to another format. At the moment with all the crashes, I can’t even get into Options to see if that function is there. Lots of work is now unavailable to me and, though I have no doubt you’ll get a fix out there in due course, I still have a corrupt database and much work that I can’t get to. I look forward to a rapid fix. Is it possible to print a collection, or create a pdf ?